All transactions are safe and secure with a reliable history in online purchasing behind each of our associates. 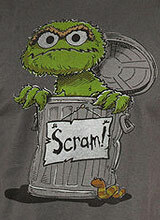 Buy the Oscar the Grouch Scram t-shirt to own Sesame Street clothing and merchandise. It's not hard to see that Oscar the Grouch is not entirely the most pleasant character. There is no better way to sum up his personality than with this Oscar the Grouch scram design. You don't have to be the grungiest character in your group of friends to appreciate Big Bird's grossest pal. We all have different types of friends. Get this Oscar the Grouch t-shirt to show your support for both of these miserable creatures. Ironically, the design is bound to make others laugh. In addition to the Oscar the Grouch Scram tee above, browse the Sesame Street Clothing Gallery for more apparel like men's and women's clothes, kids shirts or hoodies.